The Women’s Convention: What Should Mothers Of Young Children Do? Question: Should a mother of young children make efforts to be physically present at the convention? Answer: I would recommend that women with young children not attend the general convention, but take part in the mirror congresses, which are held locally, in the same city, so that they can get home in an hour and a half. If you have very small children, then it is better for a few women to unite at someone’s home, not tearing themselves away from the children; otherwise, they would feel restless at heart so it isn’t worth risking that. If children are the age that they can be looked after by a husband or family member, it is another matter. You should not come to the convention at any cost. We will organize such gatherings, and you will have an opportunity to participate in them because by that time the children will grow up a bit. Question: What is the power of mirror conventions? Answer: If a good group of women, strong, cohesive, sincere, and open gathers at a mirror convention, then it should feel unity in their getting close to each other. They are not just getting together to look at us; they should unite with each other. Then they will have an “antenna” with which they will pick up what is felt here. Otherwise, the convention will be an ordinary performance for them: They will listen to the lectures, watch workshops and presentations, but they will not feel the internal pressure, charge, warmth of love, the Light that in principle should bring us closer, break and destroy all the walls that divide us. If they do not strive for unity among themselves, they will not be able to catch this wave from us. The most important condition is to create, where you are, the same atmosphere we want to create at our general convention. Then according to the law of equivalence of form, you will not feel the distance, and you will “flow” in the same state with us. Question: How can I create an atmosphere of joy and seriousness at the mirror convention? Answer: It doesn’t matter. You will feel exactly the same thing as us: the same state, the same spiritual intensity and sensation of ascent. We need to understand that the world is accelerating, as predicted by Kabbalists; everything comes true precisely. We should definitely rise to a good level because the world demands it. It has lost its control, it has nothing to aspire to, nothing to live for; it’s as if in a suspended state. And here we must show the world our strength, our drive to move forward and that there is a goal worth living for; there are wonderful intentions and possibilities; in fact, a bright future is open before us. Whether we can realize it depends only on us, not on anyone else! Unlimited possibilities are open before us. After all, only we are the masters of our state, and the whole world follows us. Question: How can you “exit yourself”? Do you connect with everyone through internal concentration, in thought, or by physical contact and interaction? Answer: Everyone is different, but rejection is manifested in everyone according to his egoism, and according to this, he is given the opportunity to make efforts. You should not think that it’s easier for someone and more difficult for someone else. Even if everything comes easy for someone, it’s only at the beginning. So, nothing comes easy to anyone; it’s weighed out equally for everyone. There are people who are more open and expressive, and conversely, some are more reserved and introverted. But in the end, no one can say that he should make more or less effort than the other; this measure is equal for everyone; there are differences only in the expression, in the style of the external manifestations, but not more. That’s why there is no one we should be envious of. According to the nature of man, with the conditions that are always set for him from Above, he is given strength and ability to overcome obstacles. Question: What should you contribute to the group so that it will later help you come out of a descent quickly? Answer: We should accumulate efforts in the group before the descent comes, to convince the friends that we have to worry about everyone. There should be the spirit of mutual help in the group. This is called the greatness of the goal that is constantly among us in the air. A group is where you fulfill the goal, a pool of powers, a pool of exertion. You receive the Light that Reforms through the group and the Light that Reforms connects you to the group. Eventually you discover that this network of connections already exists in the group. You discover the right connection in it and according to the equivalence of form you discover the Creator. All this is fulfilled in the group. In fact, we constantly correct the group or discover its real form. Now we see it the way it is depicted in our corrupt attributes, as it says: “One judges according to his own flaws.” From above, on the Creator’s part, it’s a whole system, an ideal one. We need to attain the same perspective as from Above. We haven’t met by chance and we have been connected from Above into one group: Someone may enter or leave; someone may be near or far. In such a way, above us, we build the spiritual structure, which gradually becomes one desire that was created by the Creator. The truth is that there is one point left in the desire that was created by the Creator. 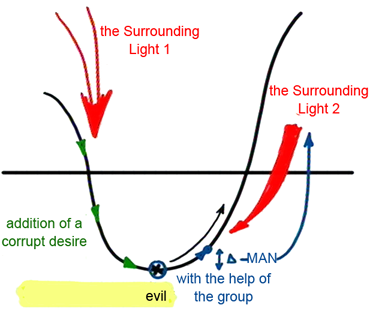 Everything else, by which this point was blown up, by developing different connections, manners, systems, all this is a result of the Light’s influence on it. The point of the desire itself remains as it was, but the Light that enters it blows it up and fills it with its attributes. This is called Malchut of Ein Sof (Infinity). Descent Is Only In Ascent! Question: What state does a person go through at the lowest point of the descent and what is he supposed to do then? What is our mistake? Answer: If I fall to the bottom of the descent, then at this lowest critical point I cannot do anything by myself. It is as if I am neutralized by all the Light that operates on me. The Light operates on me during all the phases of my development (the Surrounding Light 1), and under its influence I descend. Its action leads to my descent by adding a corrupt desire to me. Eventually I find myself at the lowest point in which I cannot do anything. There are no means by which I can ascend; I am under the total influence of the ego. But the moment I begin to rise, at least a bit, thanks to the gap between the new state and the state I was in, I already have to do something independently. I rise to the first state with the help of the group, but thanks to the level I rose to, I now have to start doing something by myself: to raise MAN, a prayer, a request, to exert myself. I have to draw the Light by myself in order to start its influence according to my invitation and not through someone else. I cannot wake up and pull myself out of the lowest place independently and without help: “A prisoner cannot rescue himself from prison.” But the moment I rise a bit with the help of the friends, I can already carry on by myself. I am not a prisoner that is chained down anymore! I have a friend who helps me on the outside to get out of this pit. But if after I have been helped to rise a bit, I am too lazy and don’t exert myself, if I don’t immediately turn to the Light that Reforms, but wait and rise simply with the current of time, with the help of the environment, then I don’t draw upon myself new spiritual powers. The moment I get an opportunity, I immediately have to start working by myself. Otherwise the Creator will help me get out of the pit once or twice and then leave me since I don’t do anything on my own. He sends me help: through the group, through the friends, in different ways, but if I don’t respond to it enough, He leaves me. It turns out that He has to add evil and sufferings down below where I fell, different corporeal problems, so that I will finally understand that I have no choice and that I have to rise. I understand that it is worthwhile to exert myself a little and to advance for the lowest corporeal reasons. I will try to escape from corporeality to spirituality because I feel bad in my ordinary life. In that case I don’t rise by drawing the Light that Reforms but because of ordinary animal sufferings. Question: What kind of inner preparation needs to be done prior to the Women’s Convention? Answer: In order to break the barrier between us, to somehow soften the situation, we need to hold a workshop with the group or some kind of event, in order to feel that to some extent it is possible to facilitate the trend towards building a relationship: not to sit distanced from each other and delve within yourself, but to exit yourself, somewhat rise above yourself, outwards towards the others, and then we will find our spiritual vessel, Kli. It is a clear female emotion when I am inside myself, “I within myself.” With the men it doesn’t stand out so much. On the one hand, women overcome this with more difficulty, and on the other hand, more easily, since it is easier for them to determine where this “cocoon” within them is. A woman feels very clearly that it is “I within myself,” whereas a man doesn’t. Until a man reaches this “cocoon” a lot of time has to pass. Thus, I suggest for women to hold several meetings, discussions on this subject. It could be a workshop. I think it will be enough to at least begin to exit ourselves. And afterward, during the convention, we will talk about it and deal with it. Question: What would you advise women who understand the importance of their presence at the convention, but prefer not to physically go there? How is it possible to help them overcome this “cocoon”? We will have to go through many states in the spiritual work. The first, easiest, and most essential step is to invert from “I” to “we.” After all, “we” still includes me, and in it is included our general pride. Everybody disappears in this concept, not only me. We see in our regular lives that it’s relatively easy for a person to identify in such a way with a group, with a military unit, with the family, to tie himself with other bodies. Later on, greater and more difficult discernments will arrive, more personal correction. I begin to worry precisely about the most hated people who cause me the most troubles and problems. And it is not even just hatred, I open the highest degrees of hatred and repulsion that an ordinary person cannot even imagine and feel. I, however, must rise above all my ego and reach such a state that this most-hated person, whom I would want to trample, becomes more dear than myself, and I prefer that he will get all the best, and nothing will be left for me. And in all these actions, the rescue is only the greatness of the Creator that rises above my self-importance, in order to help me happily get rid of my “I” for the sake of another’s benefit. I will be thankful for the opportunity that was given to me to turn my hated ones to the Creator’s beloved ones, because from them He will get greater pleasure.